Nahanni provided all civil works, mechanical, and electrical support for the installation of a new portal conveyor system. 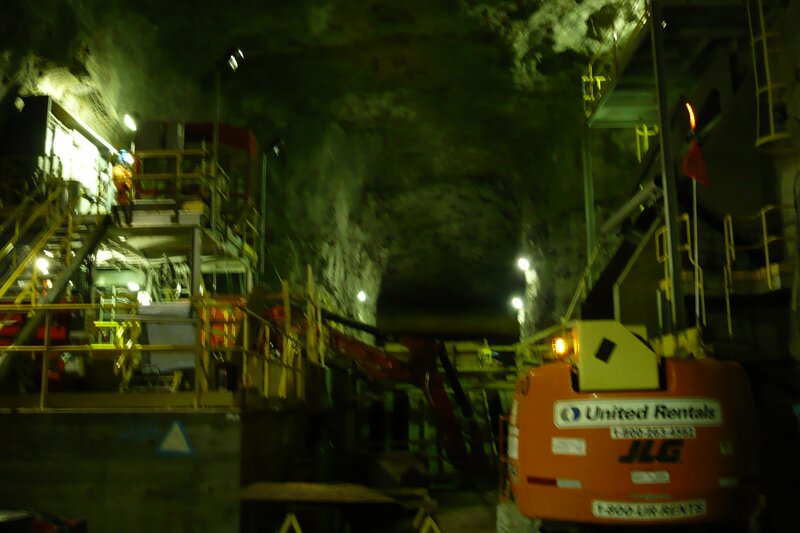 Nahanni Construction provided all civil works, mechanical, and electrical support for the installation of a new portal conveyor system at the Ekati Diamond Mine. From the very start, we needed to coordinate our efforts with the mine crew on site. After all, Ekati is an operating diamond mine, and shutting down for the installation of a new portal conveyor system simply was not an option. Add to that challenge, the small window for shipping equipment and materials on the winter ice road, as well as the typical trials of operating underground, and the margin for error on this project was very slim. Nahanni Construction coordinated all concrete pours for this project around the blasting schedule for the mine, and found innovative ways to work around production equipment. We also prioritized shipments to make sure that our equipment and materials were on site when we needed them. Nahanni’s team of 65 workers poured over 11,200 cubic m of concrete and installed 3.8 km of conveyor. Nahanni performed the majority of rock drilling for this project on its own. Nahanni lost zero time to safety incidents over the course of both projects.